Transaction signer tool now have json autocomplete and validation. 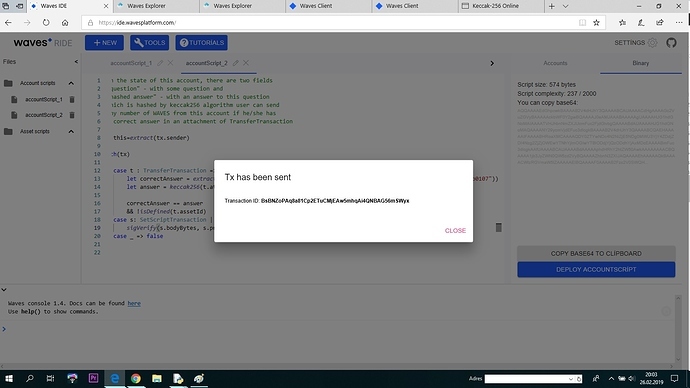 It is possible to use it as transaction editor. Removed syntax tree tab. Errors available at binary tab. Added WavesKepper support. For now, only in transaction signer tool. Fixed minor bugs with multiline commands. Files tab. Scripts won’t be lost on editor tab close. You can find and reopen your file via Files tab on the left. Removed confirmation on tab close. There are two kind of files: account script and token(asset) script. Both kinds can be created via ‘NEW’ button menu. You can now deploy scripts via UI. ‘Deploy’ button on ‘binary’ tab will create ‘setScript’ or ‘setAssetScript’ (depending on file type) transaction and open it in transaction signing tool. 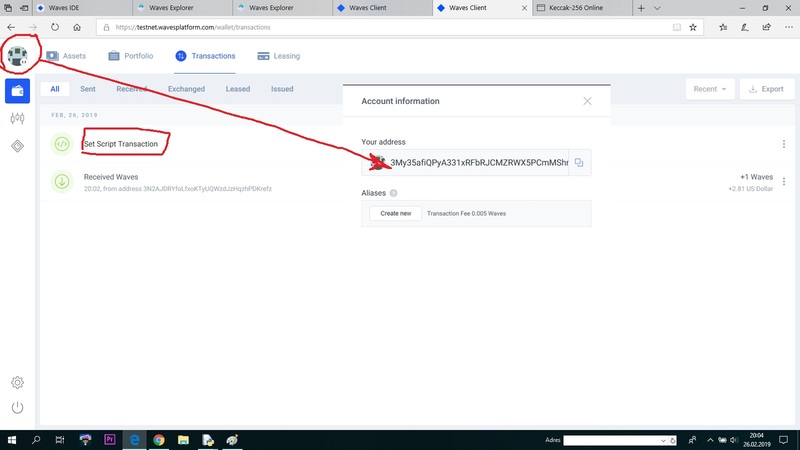 In this tool you can sign transaction via seed, account or WavesKeeper and then press deploy button. Updated ride-js compiler to include setAssetScriptTransaction. All icons are now svg and served with IDE. Help for examples included in “https://ide.wavesplatform.com/ ”. I can’t run instances “testnet”. We look forward to video support from developers. For example, “guess.ride” can be described. 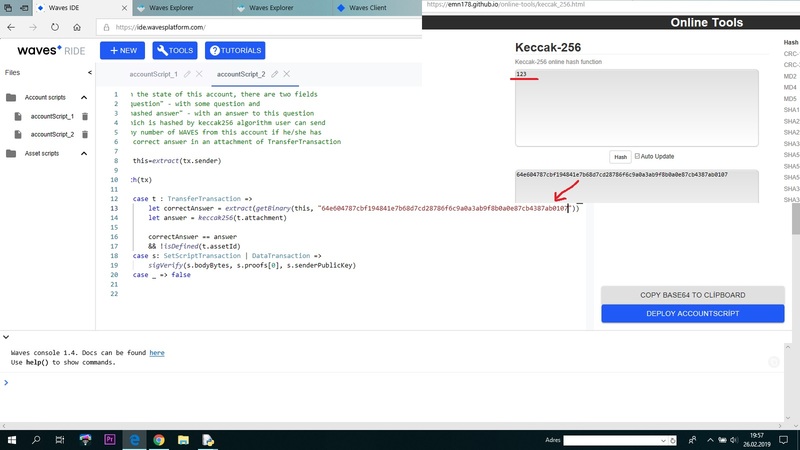 I ran “guess.ride” “smart contrat” on ide.wavesplatform.com as shown in the pictures below. But then I don’t know how to develop. 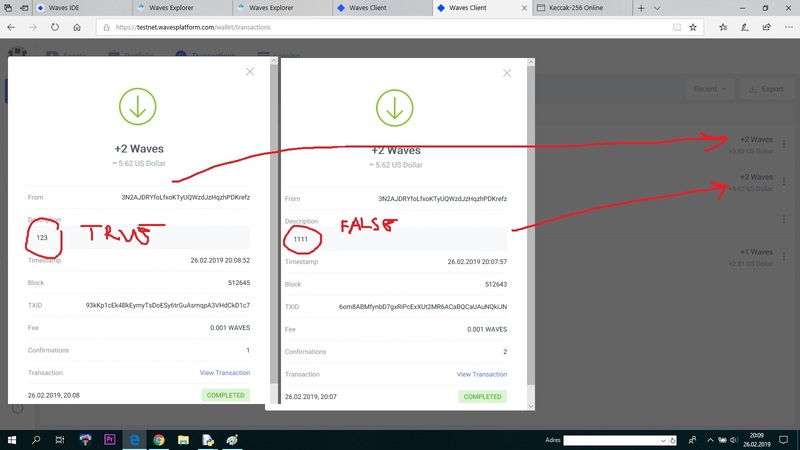 You set script on one account but then send transaction from the other. In your case ‘from’ address should be the one starting with 3My35… Another thing is that this example reads hashed answer from account data, not from string in contract. Keep in mind this is just contract sample. If you want to ask questions specifically about this contract please ask on https://github.com/wavesplatform/ride-examples, where this examples are located. You can also ask on our discord on #smart-contract channel. This thread is used to discuss IDE functionality.